Percida, Scombina, and Scombridae species of fish. Mainly inhabiting the open sea, these fish are extremely agile and can cover long distances at high speeds. They also reside at the top of the food chain among other fish species. There are several types of tuna: bluefin tuna, southern bluefin tuna, bigeye tuna, yellowfin tuna, albacore, etc. Approximately 1.6 million tons of tuna are caught worldwide eaHundreds of different ch year. Longline fishermen are succeeding in their efforts to feed the world through sustainable and environmentally-friendly harvests. Hundreds of different types of fish and shellfish are harvested each year to produce food for the people of the world. To catch this diverse and renewable harvest, fishermen use a wide variety of different fishing gear and methods. One of these methods, called longline fishing, is an effective and environmentally friendly way to harvest seafood. It is used in oceans all over the world in small-scale fishing as well as in modern mechanized operations. Tuna longline fishing was predominantly developed in Japan. Longline gear is based upon a design consisting of three parts: the mainline, gangions (individual “branch” lines attached to the mainline), and baited hooks. Longline vessels set out a mainline supported by floats that may extend for miles beneath the surface of the ocean. Hanging at regular intervals from the mainline are the gangions with baited hooks which can be adjusted to fish at varying depths. 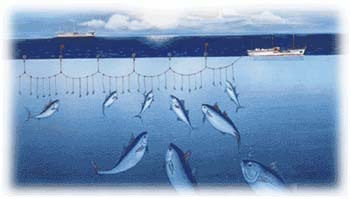 As a passive (stationary) type of gear, a longline’s chance of success is based on the target species’ demand for food. Fish are caught on longlines because they are attracted to their baited hooks. Bluefin TunaFound in subtropical and temperate waters of the Atlantic and north Pacific Oceans, also in the Mediterranean and Black Seas. Its high-quality meat commands a premium price in the “sashimi” market in Japan. Southern Bluefin TunaKnown to migrate across the southern oceans and is mainly caught in cold waters off South Africa, Australia and New Zealand. The fatty meat of this type is particularly favored in posh Japanese restaurants and “sushi” shops. Bigeye TunaDistributed widely in all waters of three major oceans. Frequently confused with the Yellowfin, but differs with a heavier and thickerset body. The name originates from its appearance. Yellowfin TunaDistribution similar to the Bigeye, but is characterized by a slim body and a belly crossed by vertical lines of light spots. Comprises the largest global catch in commercial tuna fisheries. AlbacoreHighly migratory species found in temperate and tropical waters. Characterized by its long sword-shaped pectoral fins. Its white meat is typically used for canned tuna. SkipjackFound in tropical and subtropical waters of all oceans and seas. Available all year round in southern waters but seasonally in colder waters. Its meat is widely used, eaten raw as “sashimi,” canned, or dried to produce fish broth for Japanese cooking. For more detail about Global Tuna Supply and Sashimi Tuna, click here.